Author Bali Rai visited Newquay Tretherras on Thursday 29th April 2016 to talk to Year 8 students about his passion for literacy. 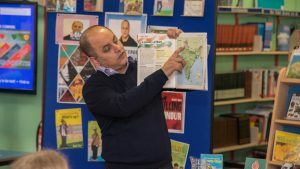 Bali Rai was one of the authors attending the Kernow Youth Book Awards, on Wednesday 28th, at the Eden Project were his latest book Webb Of Darkness was selected for an award. Over 250 students attended the awards from all schools around Cornwall. All of Bali’s teen titles have been short-listed for awards across the UK, including twice making the Book Trust Teenage Prize shortlist. During his visit to Newquay Tretherras, the award-winning author spoke to students of how his passion for knowledge in a library started at the age of 5. Bali has been in Cornwall visiting 4 schools and talking to students how important literacy skills are for anyone who has ambition and wants to make their life a success.